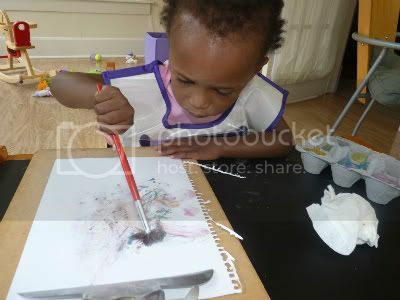 Marlie's package of eco-paints and art smock arrived yesterday just in time for her to create an abstract masterpiece. It's called Waterfall. Yes, my baby is that gifted. Absolutely love her look of concentration! So cute and look at her concentration! She looks like a serious artist. I've been loving all the art Deaglan's been churning out. It's hung all over the house. She is so focused on her work! Too cute!